50 ans après avoir co-créé l’équipe des Envahisseurs dans les pages d’Avengers #71 (un épisode intitulé…Endgame ! ), le vétéran des comics Roy Thomas racontera une aventure inédite de Captain America, Namor et la première Torche Humaine pendant la Seconde Guerre Mondiale dans le one-shot Captain America & The Invaders : The Bahamas Triangle. La célébration du 80ème anniversaire de Marvel Comics continue avec ce numéro spécial dessiné par Jerry Ordway qui avait notamment travaillé avec Roy Thomas sur le titre All-Star Squadron pour la Distinguée Concurrence. Dommage que ça ne dure qu’un an. Et si c’est l’occasion de revoir Jerry Ordway au boulot, j’en serais sûrement ! Apparently Marvel has released the news that Jerry Ordway (my colleague from the early-1980s days of ALL-STAR SQUADRON at DC) and I will be doing a 30-page CAPTAIN AMERICA/INVADERS SPECIAL. 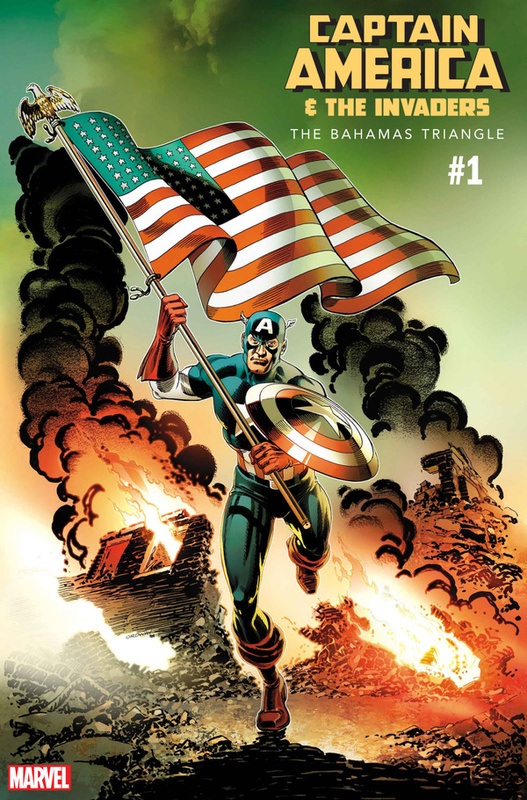 Marvel editor Tom Brevoort approached me about doing some sort of special a couple of months back, and I said I was up for whatever–AVENGERS, DEFENDERS–but that I’d prefer to do an INVADERS story set during World War II. Since Captain America’s better known than the Invaders per se, Tom suggested centering it more around Cap, which was fine with me. I toyed around with the idea of a story set during the Battle of the Bulge (which would still be fun to do), but ultimately decided, with Tom’s approval, to do a story set in May of 1941, more than half a year before Pearl Harbor and the soon-after founding of the Invaders in GIANT-SIZE INVADERS #1. Why May of 1941? I discovered that, amazingly, at that time while Britain was fighting the Battle of the Atlantic with Nazi U-boats and America was aiding Britain enough that it was in a virtual undeclared naval war with Germany, President Roosevelt and several key advisors and Cabinet members went on a fishing trip on FDR’s Presidential yacht POTOMAC out to the Bahamas… which were then British colonies, many miles from U.S. shores. That little bit o history proved irresistible to me… because it made FDR vulnerable… and also because the Duke of Windsor, the former King of England (who had stepped down in the 1930s because Parliament wouldn’t let his wife be queen), was governor general of the Bahamas during WWII. More: It’s well known not just that the Duke of Windsor had Germanic-leaning tendencies, but that Hitler was desirous of one day placing him on the English throne to replace George VI or any subsequent Windsor. Trust me on this: This story is not going to rewrite or undercut any INVADERS stories I wrote or edited in the 1970s or ’90s. Eventually, if Marvel ever decided on a new INVADERS reprint edition with this special added to the front of the series, it would fit relatively seamlessly in place. Now, as to being totally consistent with everything written by others about the Invaders… I don’t know. But I’m not deliberately trying to undercut anybody else’s stories, either. I’m just looking to have fun with an area of Marvel WWII history that hasn’t been documented in the past. Naturally, I’d love it if this led to my writing a regular INVADERS series which would pick up from the last one I wrote (GIANT-SIZE INVADERS #2, set in the middle of 1942), but right now I’m just interested in telling a particular story. moment Tom Brevoort asked me if I had any suggestions for the artist (since it had to be someone who could work in the old “Marvel style,” as I wasn’t interested in writing the book script-first), Dann threw Jerry’s name into the hat–and as soon as I had that thought, there was never really a second choice. He’s done a great cover already–the alternate cover, based on a Gil Kane 1970s INVADERS covers, is excellent, also–and I’m hoping that things only go upward from there.